The UN Security Council unanimously adopted a press statement strongly condemning North Korea's recent multiple missile launches, South Korea's foreign ministry said Wednesday. The statement approved on Tuesday (US time) in an emergency UNSC meeting in New York expressed grave concerns over Pyongyang's "increasingly destabilization behavior" and prodded the country to comply with UNSC resolutions banning its ballistic missile launches, according to the Ministry of Foreign Affairs and news reports. The unanimous adoption came even as the US and China, two of the five permanent UNSC members, are at odds over the deployment of the advanced American defense system THAAD in South Korea. 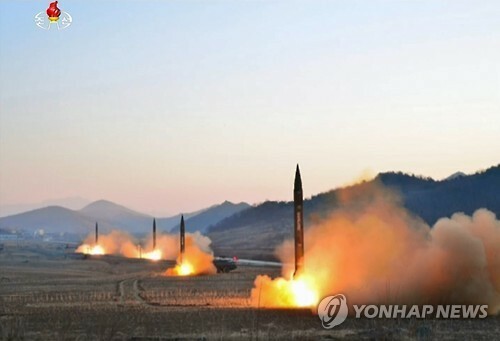 The North fired off four ballistic missiles toward the East Sea from near its northwestern Dongchang-ri missile site on Monday. Three of them are said to have landed in Japan's exclusive economic zone. The latest launch was timed with the ongoing joint military drills between South Korea and the United States. The North has long denounced the annual exercises as a rehearsal for a northern invasion. The press statement stressed that UN member countries should redouble their efforts to implement Resolution 2321 and 2270, both adopted last year at the UNSC to dry up North Korea's foreign currency income believed to finance its nuclear weapons development, according to the ministry. The UN document also called on the North to stop further violations of UNSC resolutions including the prohibition of nuclear tests, the ministry said. The North is barred from testing ballistic missiles or nuclear activities under multiple UNSC resolutions. The recent missile launch came weeks after its test-fire of a new type of an intermediate range missile on Feb. 12.